If the meek are truly going to inherit the earth, it may have started with the Federal Reserve.Fed Chair Jerome Powell appears to have wilted in the face of blistering criticism of his actions by President Trump, judging by his November 28 speech to the Economics Club of New York. Two weeks ago, his remarks in Dallas had a hawkish ring to them. He said: “I’m very happy about the state of the economy now.” He warned that markets need to get used to the idea that the bank could raise rates at any time. He didn’t appear very concerned about risks to the Fed’s outlook except to say they were “monitoring” them. Financial markets were convinced and they took the Fed Chair at his word. They sold stocks and bought US dollars. The next day, Mr Powell seemed to change his tune. Was it a coincidence or was Mr Powell afraid to find out if he would become the first Fed Chair to fired by a President for cause? Whatever the reason, on November 28, the hawk became a dove. In his speech to the Economics Club of New York, he announced that interest rates were “just below” neutral, implying a much slower pace of rate hikes than previously expected.It was also a far cry from his October 3 proclamation of rates being “a long way from neutral. Wall Street traders were ecstatic.The “easy money” party wasn’t over.Closing time had been pushed back, and the Dow Jones roared higher, gaining 617.70 points by the close. US dollar bulls became steers with a rally in AUDUSD and NZDUSD leading the way. It may not be fair to dismiss Mr Powell’s call that rates are “just below normal” as “Fake News” but US Treasury yields do not support the claim. 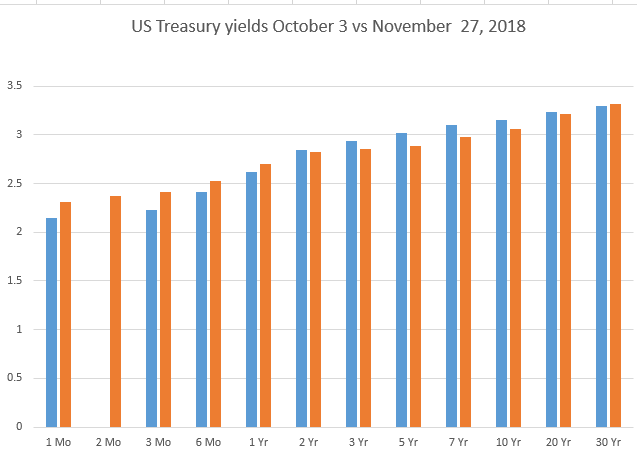 US Treasury yields aren’t a whole lot different on November 27 than they were on October 3 as evidenced by the following chart. The “neutral rate” is a dynamic number not a fixed level and estimates of its level change often. That may be why Vice Chair Richard Clarida emphasized on Tuesday that monetary policy would be data dependent. The data will take on even more importance if President Trump and Chinese President Xi Jinping fail to find common ground to jump-start stalled trade talks. The two leaders are meeting for dinner on December 1 in Argentina. Trump has been openly antagonistic over China’s trade policies. He is hoping to use the threat of higher tariffs and a new round of tariffs to leverage concessions from China. On November 28, the New York Times reported Trump was looking for a compromise on trade that would lead to a delay in new tariffs while still making hime look good. The Chinese may not be so agreeable. If the meeting fails, the Powell speech will be forgotten, and fears of a global economic slowdown will be the driving force for markets.